Please refer to our stock # cc2 when inquiring. These stunning vintage earrings were designed by couture jeweler, Robert Goossens for the house of Chanel. Each clip earring is 3 1/2" long x 1" wide and both are made from antiqued gold tone metal. 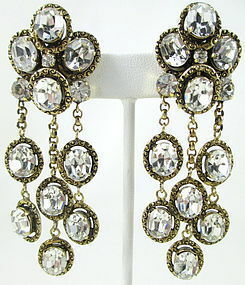 They have a dramatic baroque design and each have 13 brilliant faceted crystal accents. They are in excellent condition and are signed "Chanel" with the logo and 1985.